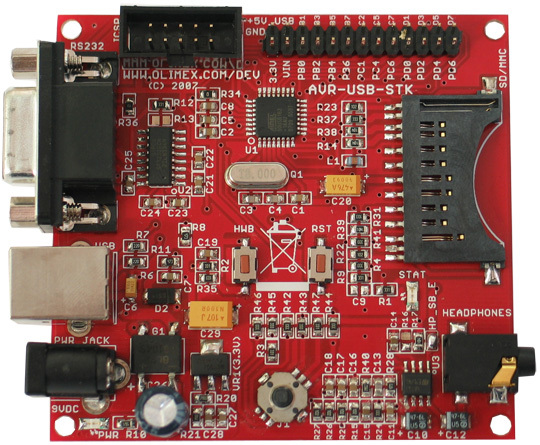 The AT90USB162 comes pre-programmed with a bootloader which allows code to be programmed inside the chip without any external programmer, atmel supplies a piece of software that you can use to load your hex code to the device. The AT90USB162 is a high-performance, low-power Atmel 8-bit AVR RISC-based microcontroller combines 16KB ISP flash memory with read-while-write capabilities, 512B EEPROM, 512 bytes SRAM, 22 general purpose I/O lines, 32 general purpose working registers, two flexible timer/counters with compare modes and PWM, USART, programmable watchdog timer with internal oscillator, SPI serial port, debugWIRE interface for on-chip debugging and programming, and five software selectable power saving modes. The device operates between 2.7-5.5 volts. A nice easy board to get up and running, olimex supply schematics, a manual and a few code examples and you will see from later I was able to use a low cost USBASP programmer to program the device using the 10 pin header that you can see in the picture below. There are enough on board features to play with and the pins from the microcontroller come out to a header which is handily located on the side of the board, easy to make your own adaptor board if you wanted. In this example we simply toggle the entire PORTD on and off, there is an onboard LED which will flash on and off, you can also connect another LED as well if you like to test.